The saguaro cacti are everywhere, and I am still intrigued by these hardy plants that can survive for decades—centuries, even—in the extremes of the desert. I’m always seeing figures in these desert giants, wondering about the stories they tell and the people they could represent. Some of them look like dancers, others like soldiers, yet others like doting parents as their children play on the trail. The desert has so much to offer—beautiful views, diverse fauna and flora, and a peace that can’t be described—it must be experienced. Especially in the winter, when fewer people are on the trails, the quietness of it all is awe-inspiring. But at the same time, the sound carries, so that the voices of your loved ones are always within reach, even if they’re far ahead on the trail. 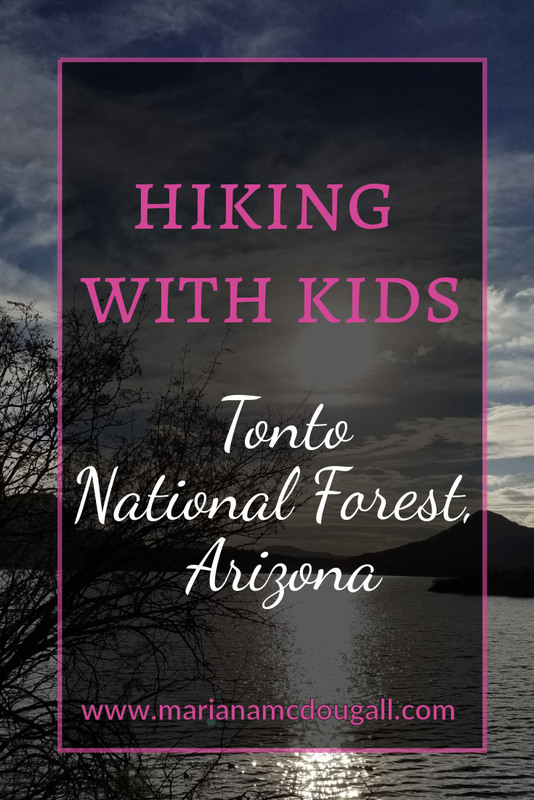 Hiking at Tonto National Forest is not something to do in a hurry. You must take the time to stop and look at the gifts the desert offers—the mountains, the sky, and the peace of the sunset. 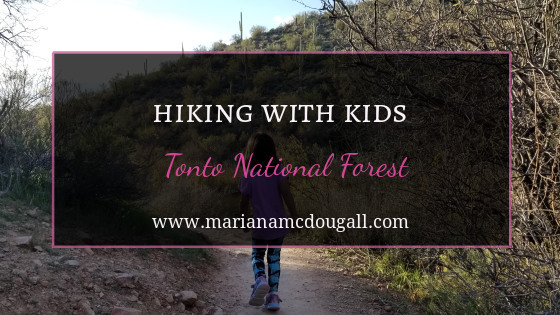 And when your feet have tired of exploring nature’s beauty from the trails, rest them in Saguaro Lake, and watch your children delight in playing on the rocks and observing the ducks that come to visit. The lake’s shore is made of small pebbles, so wearing shoes is recommended for those with sensitive feet. Once you’re in the water, it’s no big deal. The kids enjoy wading and playing on the rocks, and the day is perfect for an outing. After enjoying a lovely time at Tonto National Forest, our day ends even more beautifully, as we see these gorgeous wild horses. I had visited the desert before—over 10 years ago, when Dan and I set out on our two-month Great North American Swing Road Trip. But back then we just passed through. This year, we’re getting a chance to really explore. Even when we just passed through 10 years ago, I still thought the desert was beautiful. Now that I’ve had a chance to get better acquainted, I love it even more. Have you ever been to the desert? What is your favourite thing about it? I love reading about your adventures. The desert pictures are wonderful. Thank you so much, Marg. It means a lot to me that you read and comment on the blog. Hope you are well.